If Donald Trump was hoping to get a quick rise out of Hillary Clinton with a new nickname - "Crooked Hillary" - it didn't work. "He can say whatever he wants to say about me, I really could care less," Clinton said on ABC's "This Week With George Stephanopoulos," "I don't respond to Donald Trump and his string of insults about me." Trump unveiled his new nickname for Clinton at a Saturday rally in Watertown, New York. It's the latest in a long list of nasty names aimed at undermining his rivals: "Lyin' Ted" for Ted Cruz, "Little Marco" for Marco Rubio, and "Low Energy Jeb" for Jeb Bush. "So I'm self funding. All of this is mine. When I fly in, it's on my dime right, it's on mine. And what does that mean? That means I'm not controlled by the special interests, by the lobbyists," Trump said while campaigning in New York. "They control crooked Hillary and they control lyin' Ted Cruz right? They control lyin' Ted." "I can take care of myself," Clinton said on "This Week" when asked to respond to Trump's jab. "What I'm concerned about is how he goes after everybody else. He goes after women. He goes after Muslims. He goes after immigrants. He goes after people with disabilities. He is hurting our unity at home. He is undermining the values that we stand for in New York and across America. And he's hurting us around the world." During the interview with Stephanopoulos, Clinton also doubled down on her decision not to release the transcripts of her paid speeches to Wall Street, something even her supporter New York Sen. Kirsten Gillibrand said she should do during an interview on CNN this week. 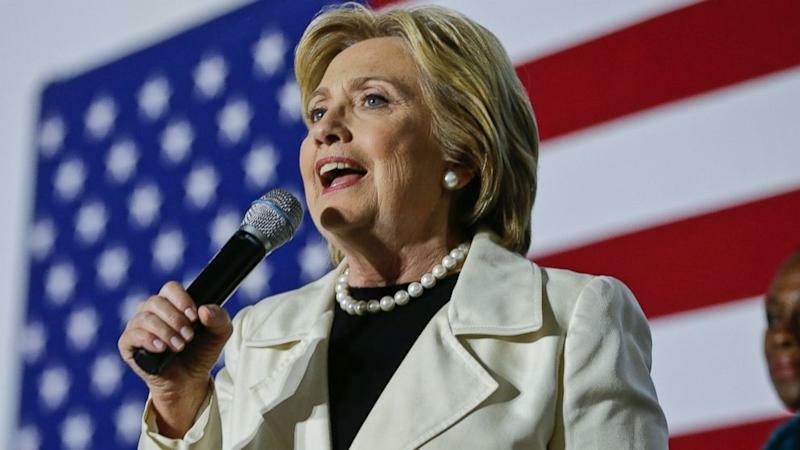 "You know, we have certain expectations when you run for president, one of which is release all of your tax returns ever since you've been in public life," Clinton said. "Now all of a sudden, there's a new standard. And I've said when it applies to everybody, you bet. I will meet that standard as well." Clinton was then asked about the Justice Against Sponsors of Terrorism Act, which would allow families of 9/11 victims and other terrorist acts to sue foreign sponsors of terrorism in federal court. New York Sen. Chuck Schumer is pushing for the legislation, while the Obama administration has been lobbying to block the bill. The bill made the front page of Saturday's New York Times, and has been in the news for weeks, but Clinton said she was not familiar with the details and would not take a position. "I don't really know about that, George. I'll have to look into it," she said. "Obviously we've got to make anyone who participates in or supports terrorism pay a price. And we also have to be aware of any consequences that might affect Americans, either military or civilian or our nation." Clinton's appearance on "This Week" comes just two days before the primary in New York, a state where she is leading Bernie Sanders by double digits, according to recent polls. "I'm very hopeful," Clinton said about her chances in the state. "I love being in New York. I love campaigning in New York, downstate, upstate, everywhere in the state." Then in what seemed to be a subtle jab at Sanders, who has criticized her fundraising, she added: "We're going to work as hard as we can because I also want to elect Democrats. You know, I am raising money to elect other Democrats. I'm a Democrat." Sanders is running for the Democratic nomination for president, but the Vermont senator is the longest serving independent member of Congress.